Located on the southern tip of Cuyuga Lake, the largest of New York's large Finger Lakes, Stewart Park is located in a tranquil place. It is just outside of the primary development of Ithaca, NY, away from the Commons, Cornell University, and Ithaca College. The primary development of Ithaca was actually away from the waterfront for the reason of better availability of fast flowing creeks for the creation of mills and more. Ithaca is Gorges, very much like the slogan suggests. There are countless giant waterfalls that are a spectacular sight to see. Because of the power that could be utilized from these waterfalls and creeks, in addition to the risk of flooding near the waterfront, the primary development of the city is a little bit inland. This land was also owned as an estate. Since the location of Stewart Park is in a relatively remote location, it was purchased by the local trolley company for a turn-of-the-century trolley park in 1894, not too different from the many others in this time period. It was called Renwick Park and included in the park were Vaudeville acts, a zoo, and a carousel. It closed in 1915, several years after the trolley line was out of operation. A little known fact about Ithaca is that it served as a Hollywood-like center for the short-lived Silent Film Era. The Whartons, the primary silent film studio, utilized the park as a production place. The beautiful views from this spot and around the city were perfect for the time before the talkies were produced. In 1920 Santa Cruz, CA was able to woo the Whartons to move away from Ithaca, leaving this land abandoned. Below you can see the century old studio building on the left and the concession stand on the right. At this point, the public park movement was in place. The entire area around Cuyuga Lake, as much of it is now, was completely privately owned. One of the city's most forward looking mayors, Edwin Stewart, saw the value in having a centrally located section of waterfront open for the people. 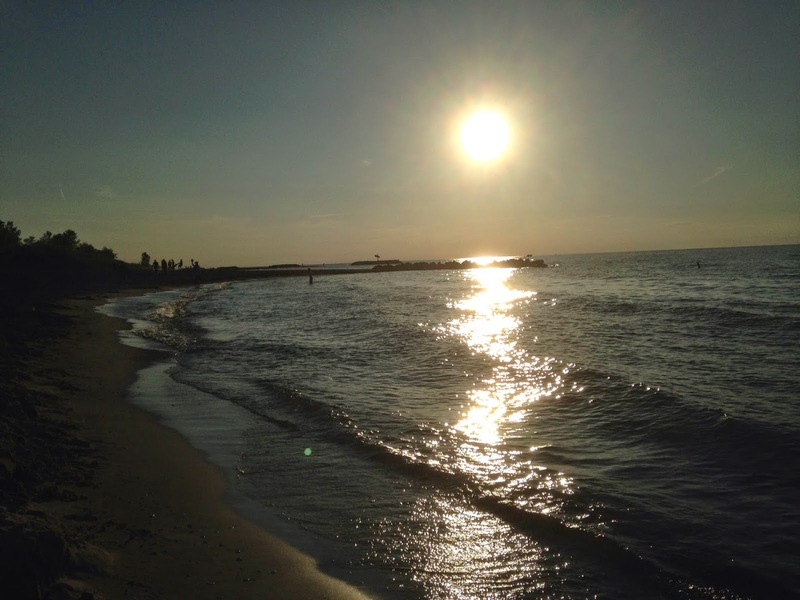 He established a community park and to this day it is a popular place with a large playground, picnic grounds, barbecue pits, swings along the lakefront, plentiful wildlife, and a wide range of recreational activities. 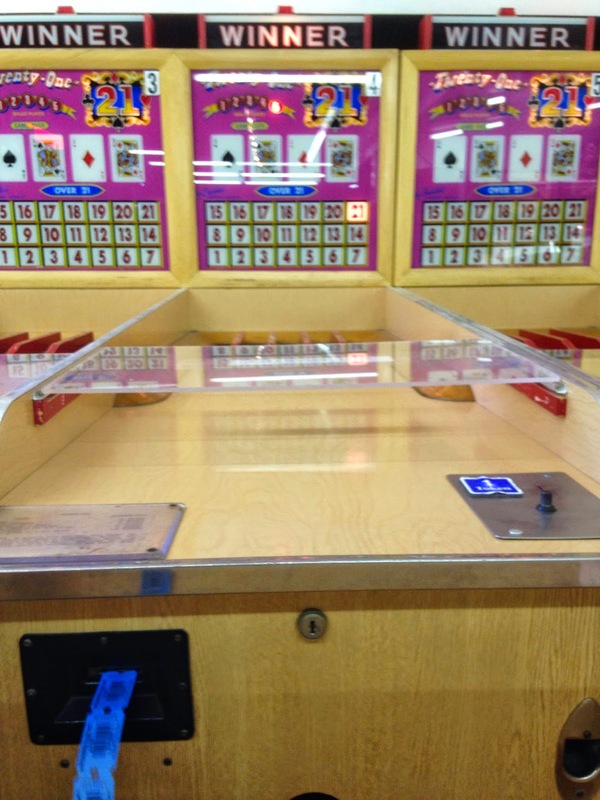 Of the most interest to us is that they opted to add back a carousel. They purchased a new carousel from the relatively local company out of the Buffalo area, Herschell. According to the National Carousel Association, the carousel was added to the park in 1951. It has the wonderful art deco style of the Herschell machines of that era, including the signature vertical fluorescent lights with curved metal serving as a halo/backsplash to the lights, for lack of better words to explain it. There are three rows of metal jumping horses. This machine is really beautiful and well taken care of. Throughout the ride you get a relaxing view of the playgrounds, trees, and the lake. If you are in Ithaca, be sure to shell out 75 cents to go ride this community treasure. More community parks should have carousels like this. Carousels help bring the community together and provide a relaxing setting for a wonderful afternoon away from it all. 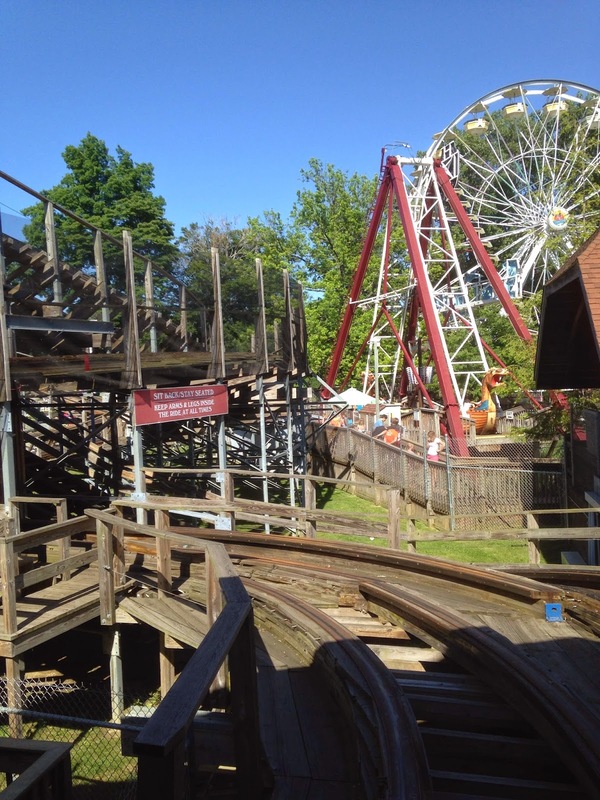 So on a nice and lazy Sunday we decided to go for a ride up to Erie and visit the always awesome Waldameer Park! We wanted to get away for the day and this is a relatively easy place to drive to and an extremely affordable getaway. 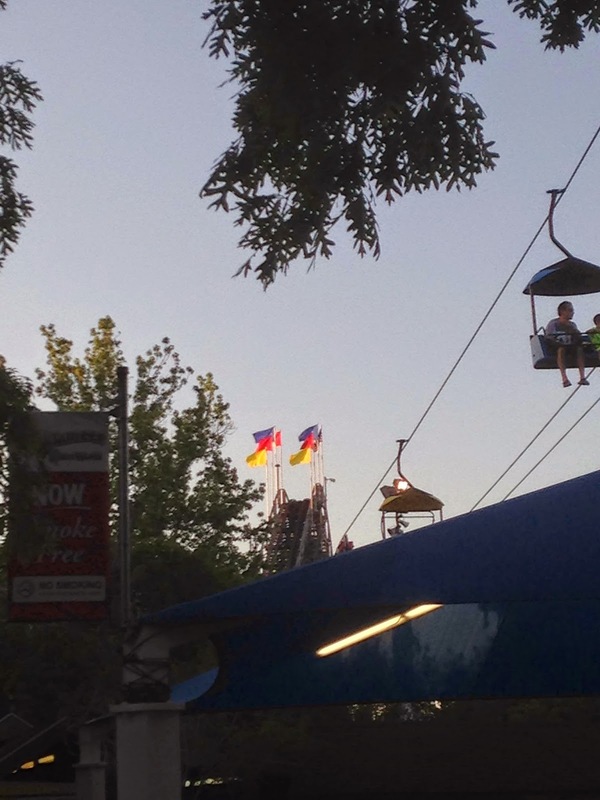 We went to the park last month, but there is really no such thing as too much Waldameer. Just look at this view from above, it is paradise! My photos were taken with my cell phone for I had a memory card issue with my good camera unfortunately. I did get this one shot in, my first test shot. I did not set up for the shot and get everything I wanted in it, who cares because the red train is about to go! My balance kind of stunk in these shots, my apologies. 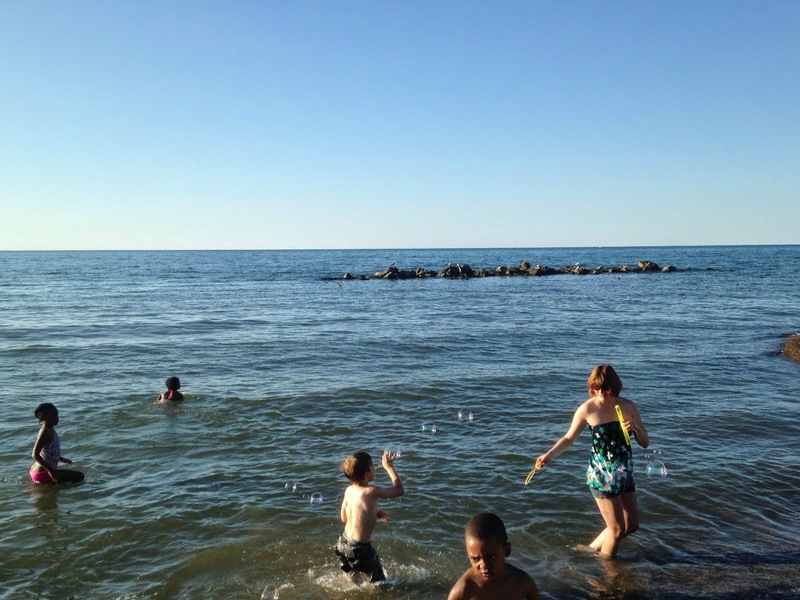 Lake Erie is not about to tip over, so don't worry! Blue train! I got my bearings better on the shot I wanted, but of course, my camera opted to not work. Oh well! 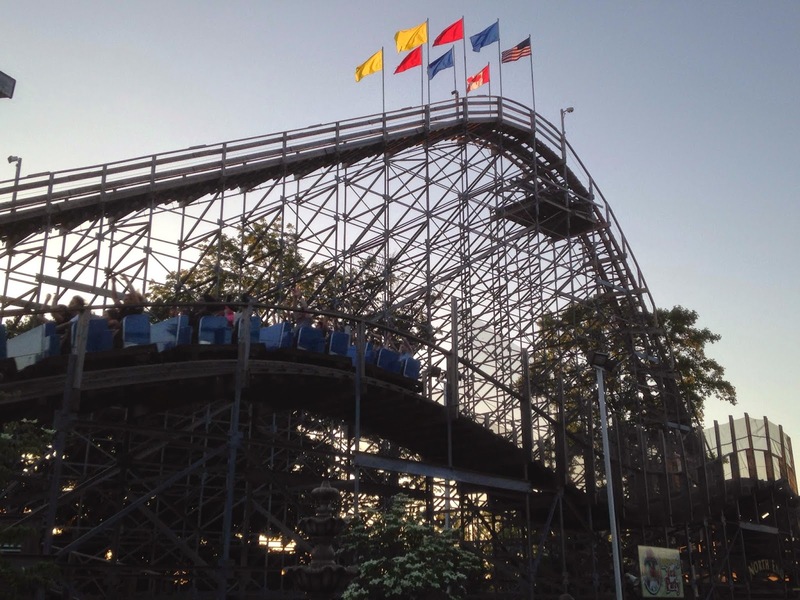 The fun and classic Comet, a wonderful Schmeck family coaster! 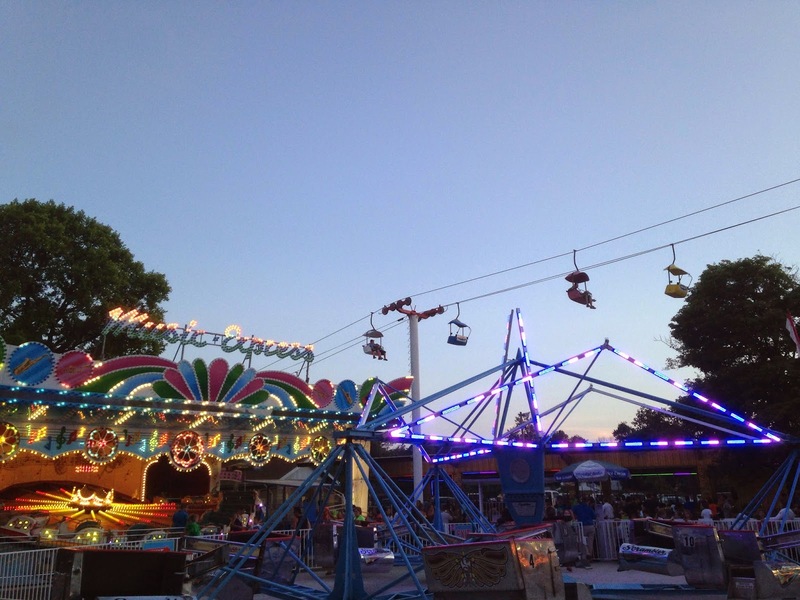 This park has a lovely and lively midway. A nice amount of people were in the park enjoying the wonderful weather. Ride time on Ravine Flyer! At this point the adrenaline is starting to run through my veins. I love this ride and love this park! Brit's favorite thing is checking out the arcade games. 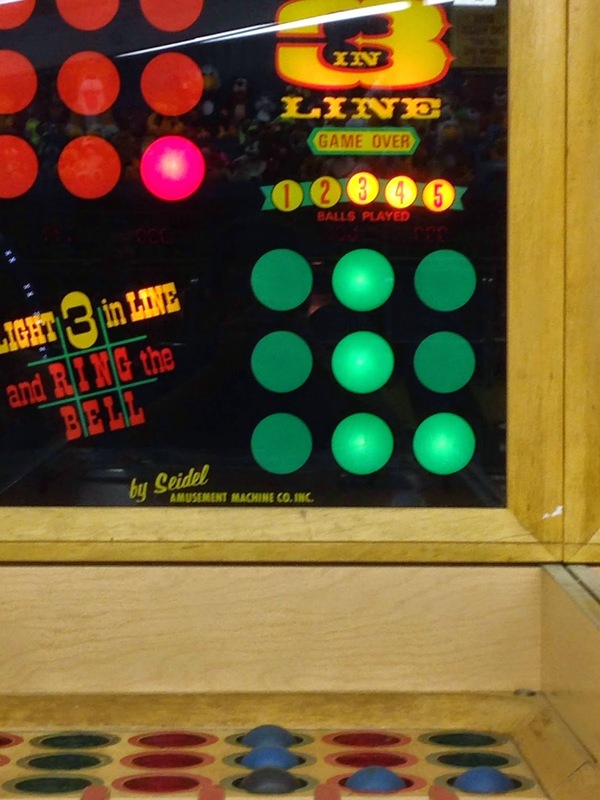 We discovered Fascination at our last Knoebels visit and got hooked on it. This is not the same, but along the same lines and completely awesome! 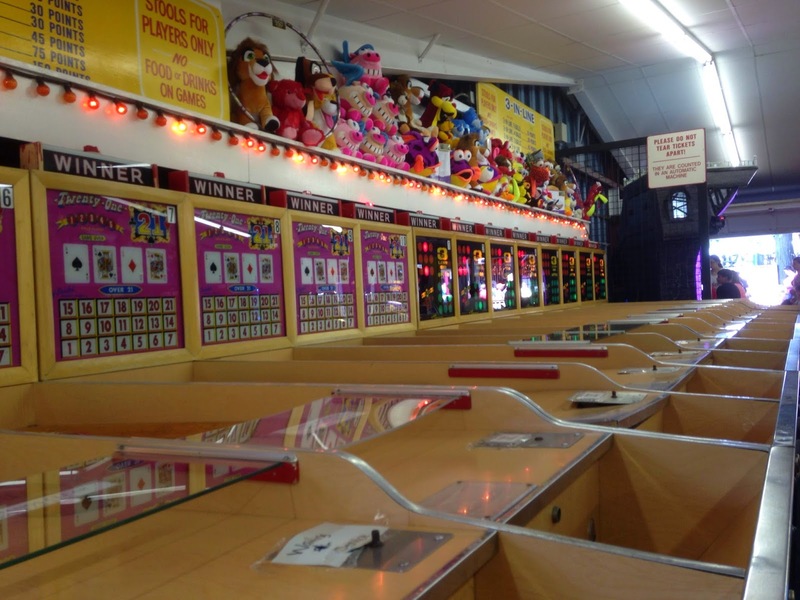 The last time we went to Waldameer I did not win, but this time I won almost every time! Brit did very well also. We opted to get some dinner and then take a ride into Presque Isle State Park. 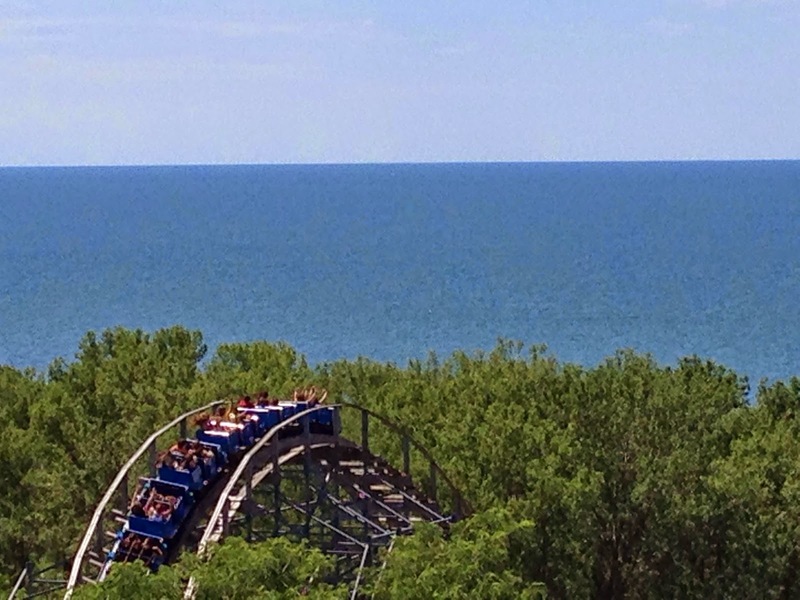 Waldameer is located at the entrance to the state park, located on an unspoiled peninsula in Lake Erie. We opted to first explore the inner wildlife refuge area before heading to the beach. 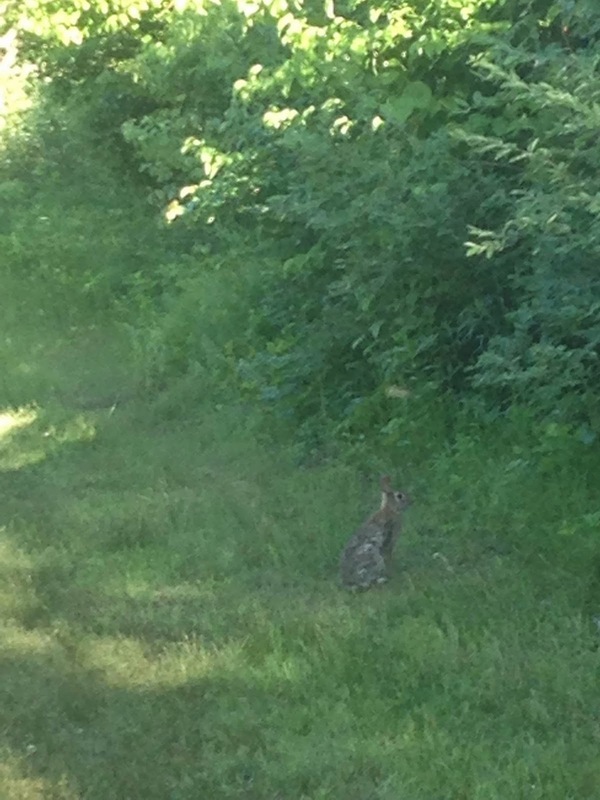 We saw an otter, a turkey, a bunch of bunnies, and a bunch of birds. Then we went and sat at the beach where Brit played with some of the bubbles we won at the arcade. She started off just whooshing bubbles around with the breeze and then like twenty kids came and had a blast catching the bubbles. Who could have predicted this? It was really funny. 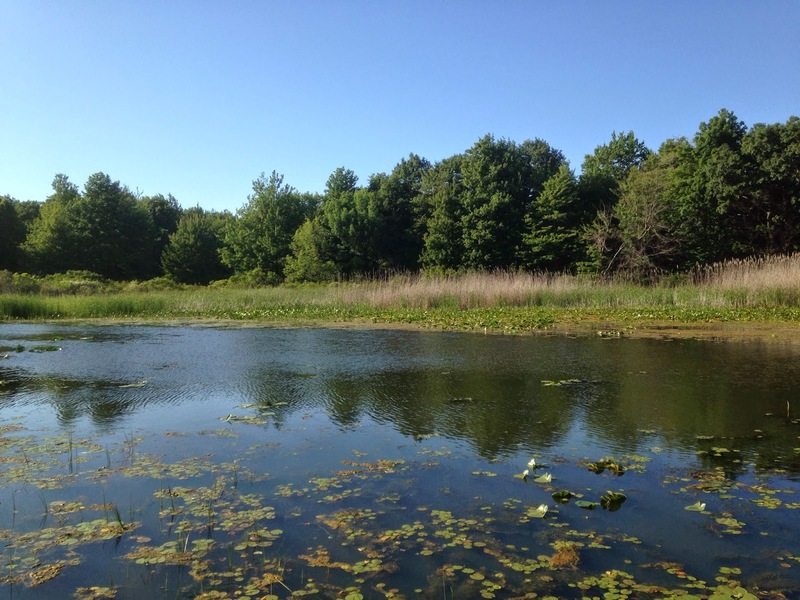 Presque Isle is a beautiful place with endless recreational opportunities. There are tons of places to hike, bike, boat, kayak, swim, and just relax. Folks are so relaxed, providing for a very chill place to get away from the troubles of life. 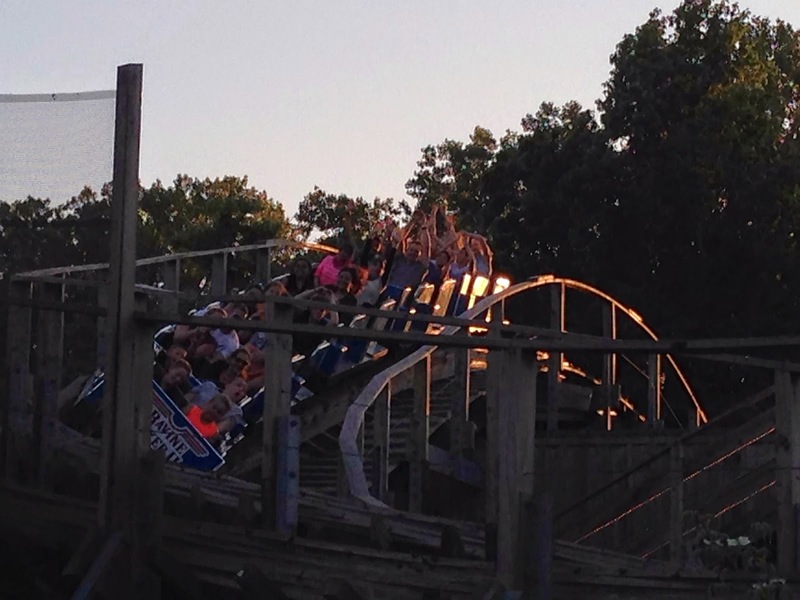 We had initially planned to finish our time at Waldameer and then get dinner. 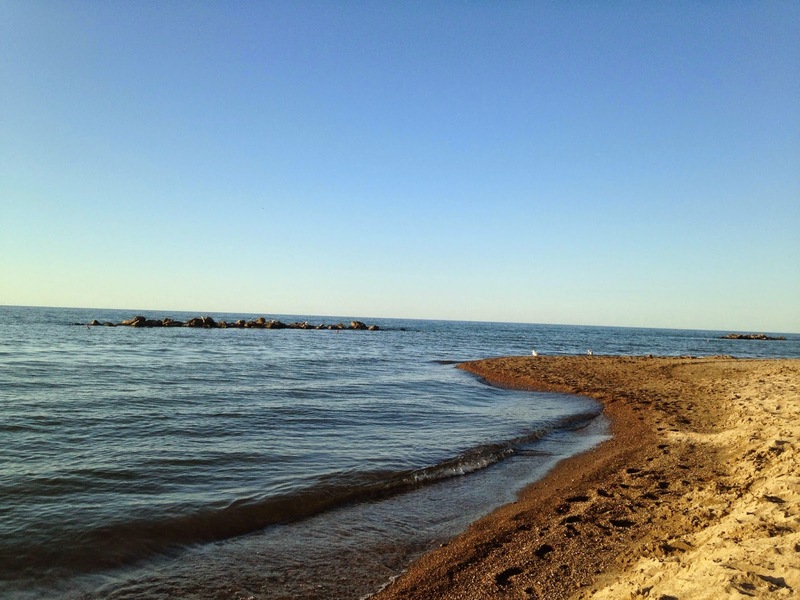 We then ended up going into Presque Isle State Park. Waldameer was naturally the gatekeeper for us and we could not resist heading back in for a few more rides and games, along with freshly baked cookies and glasses of milk! We also got to see the beautiful new LED lights that we heard so much about from Mr. Paul Nelson, the Gormans, and Andrew from Waldameer. I have to say that they look absolutely amazing! Last year's changes to the entrance way with the addition of the Musik Express, revamp of the Scrambler, and the LED lights look absolutely spectacular and fresh! I feel that they add beauty to these classics while still maintaining their classic look. Ravine Flyer is calling my name! 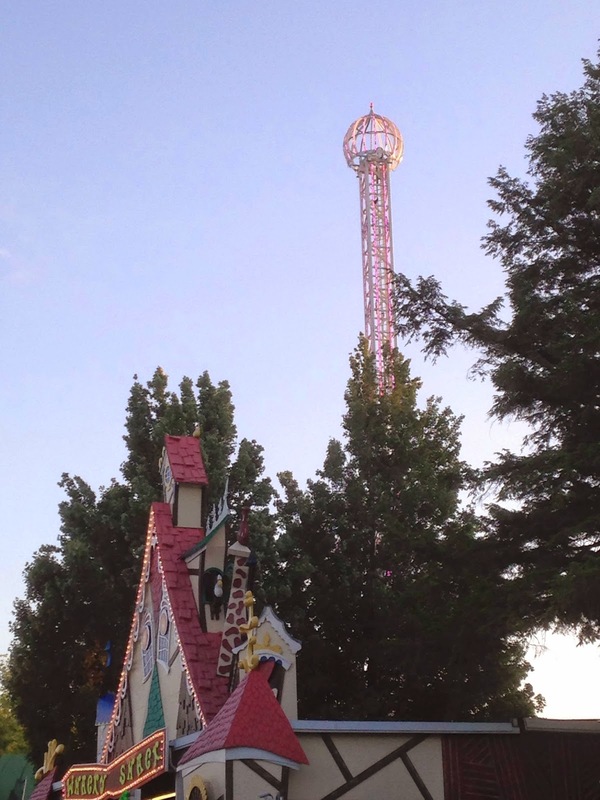 The drop tower looks stunning with its new LEDs. The Whacky Shack is Tracy darkride goodness as well. 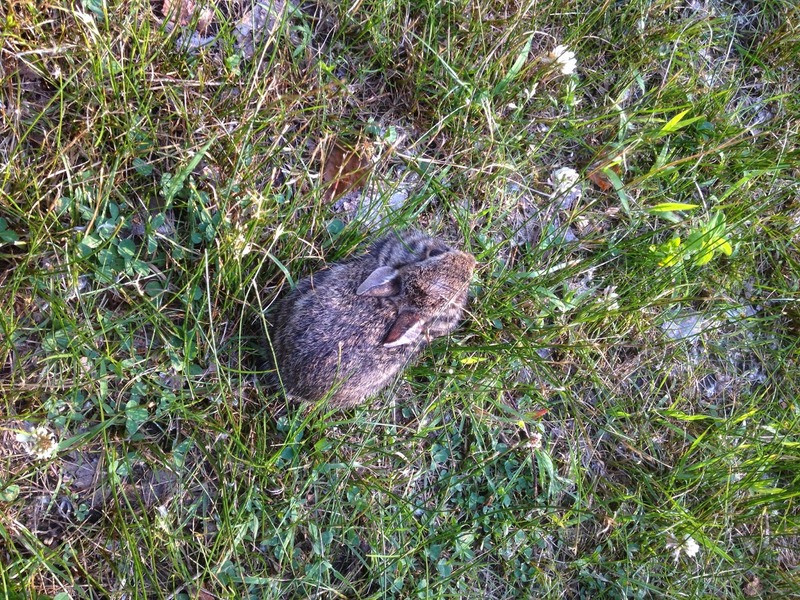 Our friend Randy does a wonderful job running and rehabilitating it. Brit sat out RFII today because she had surgery a week ago and still needs to recover. She is like a kid in a candy store when it comes to arcade games though! It was her idea to head up to the park and it was a really awesome idea. The weather was perfect. Sunny and clear with a high of 78! My last ride into the sunset. This is definitely the perfect sunset ride, with the second largest drop facing right towards the setting sun. Beautiful. That is me in the front seat with my arms up! 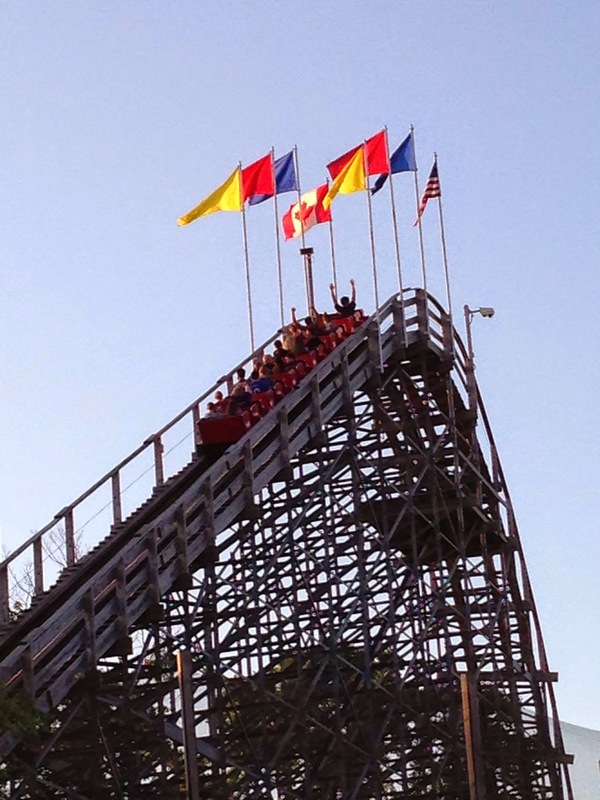 You can also see the park's ode to the red, white, and blue, and to the Canadian flag. The skies were so clear that you could see Canada from the top of the lift. 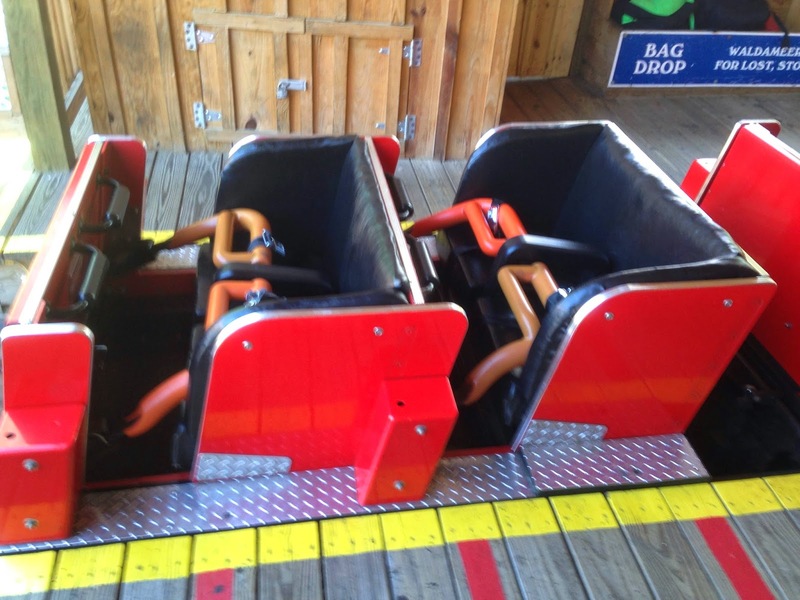 That is one twisted ride! And the lights look even more awesome! I am not sure how this park constantly makes awesome improvements, but it does. 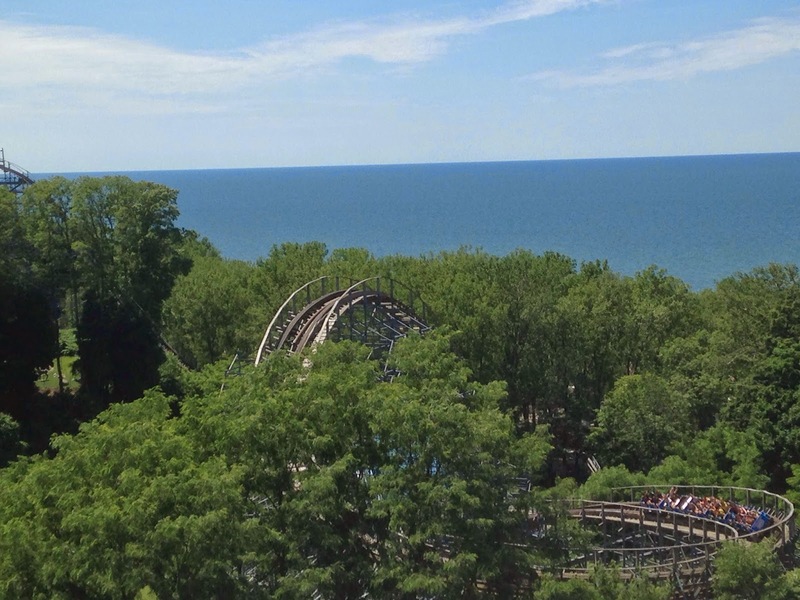 The first time I visited the park was before I became a transplant to Western Pennsylvania from Allentown, back in 2008 when Ravine Flyer II was new. We have visited every year since, multiple times most years, and each time the park looks even better. This park should be the envy of the industry in looking great. 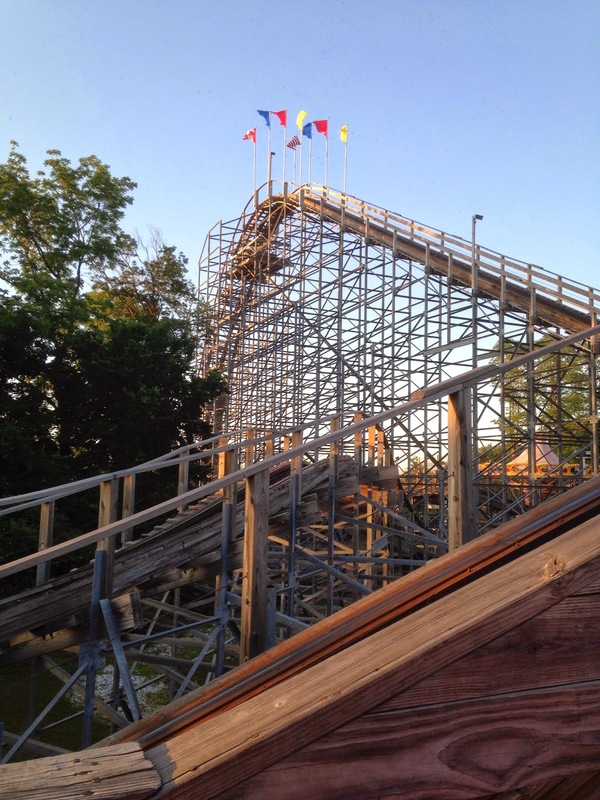 If you have not taken the trip to Waldameer, head there right away. 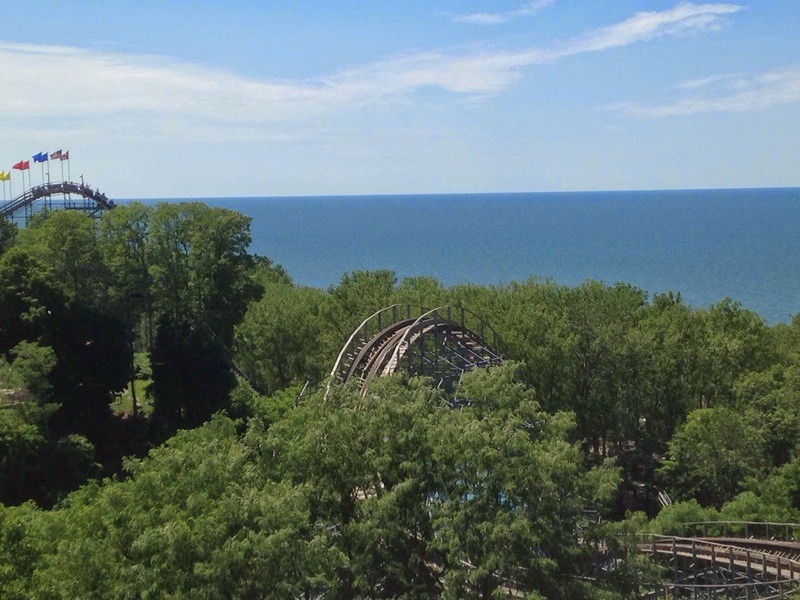 It is a really wonderful place with some great rides and a perfect setting overlooking Lake Erie and Presque Isle State Park. The park is run by some wonderful folks and it is also very affordable. Ravine Flyer II is worth whatever trip it takes, the ride is really that amazing. In my humble opinion, it is as awesome as any coaster I have experienced. 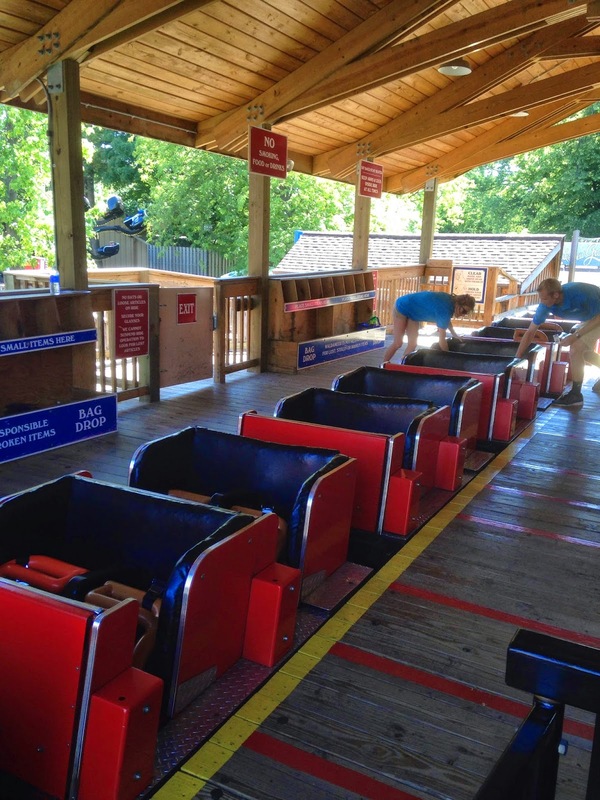 Don't forget to vote for your favorite classic wood coaster designer on the right side of the page! There is nothing like a quick coaster ride to get the adrenaline flowing midway through a long road trip. We were headed back from Ithaca, NY for the weekend, and depending upon the route we take to Pittsburgh, we either cross through Altoona or Erie and opt to stop at either Lakemont or Waldameer accordingly. As it is most of the time, the park was empty which is great for visitors, but not so good for the park. 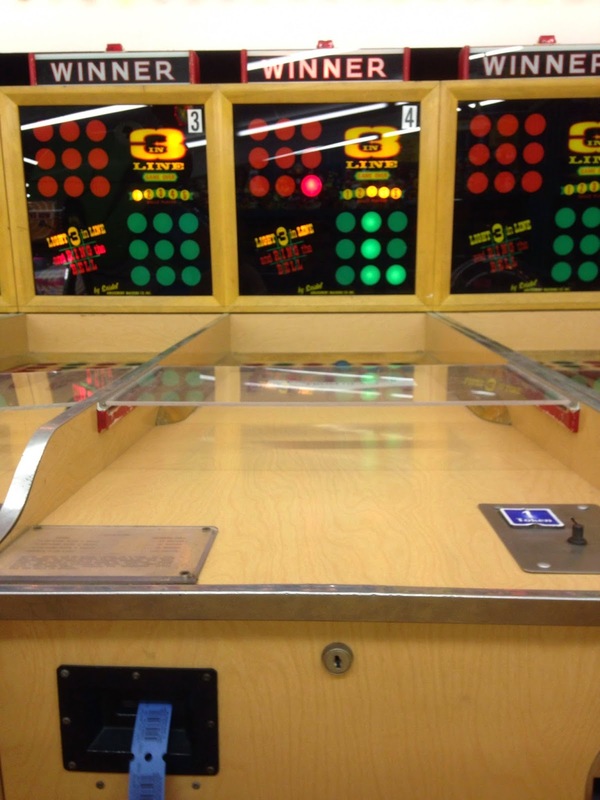 You should surely drop by for a fun and inexpensive time. 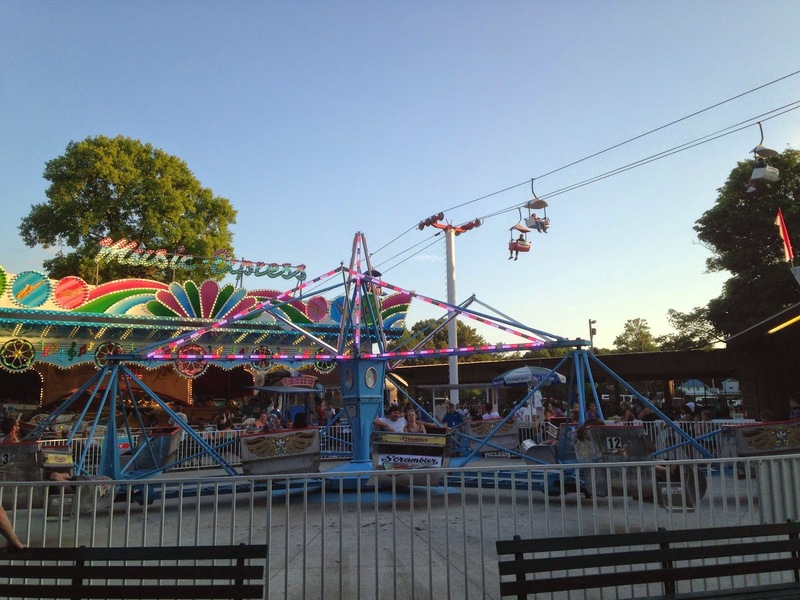 The park has a wonderful selection of rides, including the world's oldest roller coaster, Leap the Dips, and the Skyliner, a fantastic John Allen PTC creation that was transported south from the former Roseland Park in the Finger Lakes region of New York. The flat ride selection is excellent as well, rivaling and exceeding that of many larger size parks. They also keep them in great shape, leading to the rides also giving as good a ride as their identical counterparts elsewhere. The park also has a nice mini-golf course, a must for a relaxed park like Lakemont. 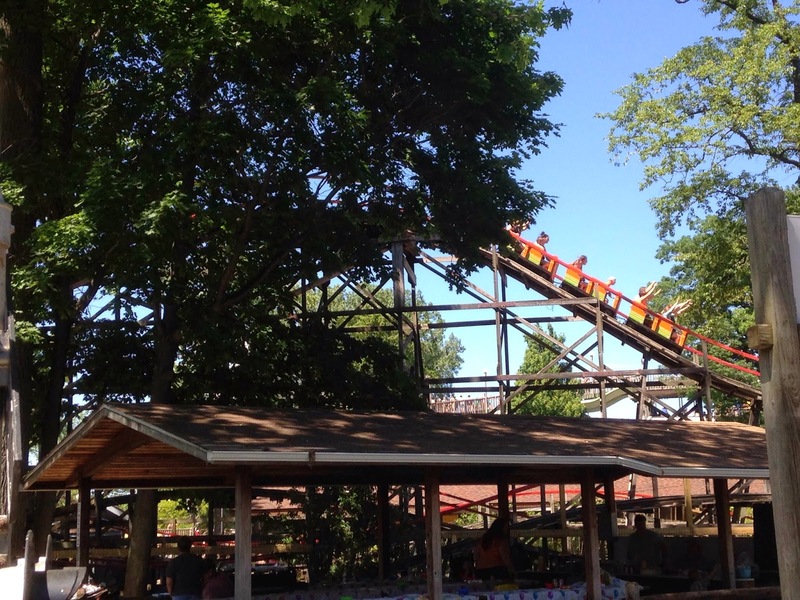 Now for Lakemont's most famous resident, LEAP THE DIPS! There appears to be fresh wood throughout the entire course. Nearly every section had fresh wood. No time to ride today sadly. I love the vast expanse of flat rides in the midway, including the super-intense Chance Skydiver looming in the distance. Now to my favorite, the Skyliner! I really love this ride! Front seat ride and no more pictures! Next to the coaster, the Altoona Curve Baseball Team was doing Batting Practice. Go take a trip to Lakemont! You can get an all day ride pass for $9.95 on the weekend, or for only $5.00 for a midweek visit. 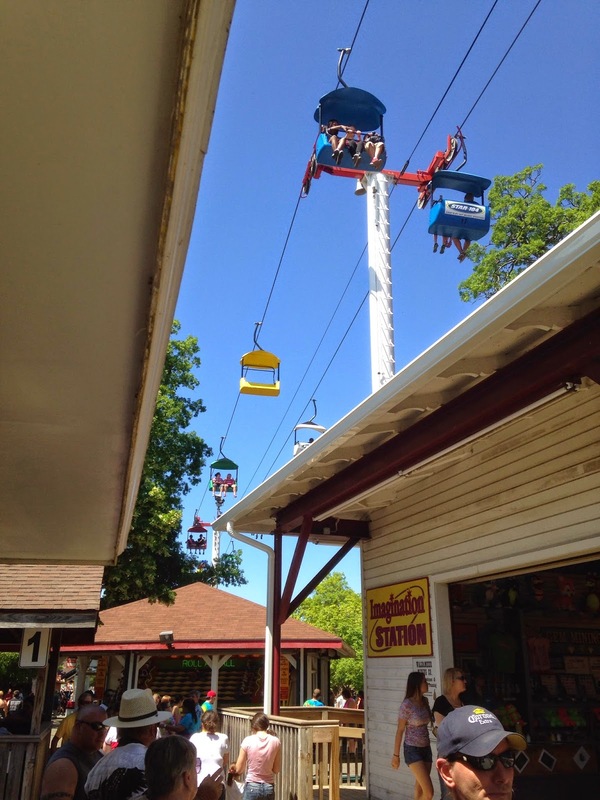 Also, if you purchase our book using the drop down menu at the top of the page I will send you a free ticket to ride Leap the Dips or the Conneaut Lake Blue Streak!